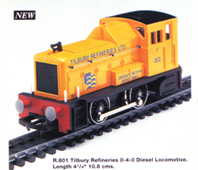 Information: The small TOPS designated Class 06 diesel mechanical locomotives with a short wheelbase 0-4-0 wheel arrangement were developed by Andrew Barclay Sons and Co. used primarily as shunters on the Scottish Region of British Railways. Details: Between 1958 and 1960 a total of 35 of these small shunters were constructed for use on the Scottish Region of British Railways. Their diminutive size did not restrict them to shunting duties and if required, they could be relied on for hauling local traffic on short-haul routes. The locomotives 7’-0” wheel base provided high axle load traction and with the 204-BHP diesel mechanical transmission made for a powerful combination and made them versatile performers. Top speed was geared for 23-MPH. The distinctive hump located on the upper bonnet in front of the cab, was in fact the fuel tank. Two variants of the design were built; one had three rear cab windows and the other only two. 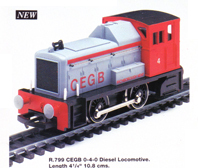 In early days the shunters were painted in coach stock BR green livery. By the late 1960’s remaining class members were painted in Corporate blue livery. The requirement for shunting locomotives was drastically reduced by the late 1960’s and with many Class 08’s available the Class 06’s became expendable. The majority were withdrawn in 1968 with only ten members surviving to receive their TOPS numbers during 1974. One of these, 06 003 survived after being transferred to Departmental duties in the Reading area until 1981, at which time she was withdrawn and subsequently preserved.